A team of researchers in Japan has discovered a gigantic streak structure in the cloud tops of Venus. 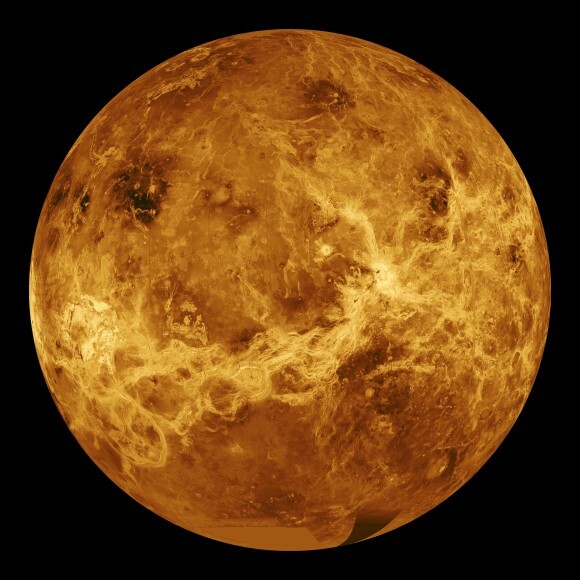 The discovery is based on observations of Venus by the Japanese spacecraft Akatsuki. The findings were published in January 9th in the journal Nature Communications. Venus is unlike any other planet in the Solar System. The entire planet is shrouded in thick clouds of sulfuric acid between altitudes of 45 km to 70 km. This thick shroud has prevented scientists from studying Earth’s so-called “sister planet” in detail. But Japanese researchers are making progress. Special Guest: Carolyn Collins Petersen -TheSpacewriter; CEO of Loch Ness Productions; author. Back in 2010, the Japanese Aerospace Exploration Agency (JAXA) launched the The Venus Climate Orbiter “Akatsuki” with the intention of learning more about the planet’s weather and surface conditions. Unfortunately, due to engine trouble, the probe failed to make it into the planet’s orbit. Since that time, it has remained in a heliocentric orbit, some 134 million kilometers from Venus, conducting scientific studies on the solar wind. However, JAXA is going to make one more attempt to slip the probe into Venus’ orbit before its fuel runs out. Since 2010, JAXA has been working to keep Akatsuki functioning so that they could give the spacecraft another try at entering Venus’ orbit. After a thorough examination of all the possibilities for the failure, JAXA determined that the probe’s main engine burned out as it attempted to decelerate on approach to the planet. They claim this was likely due to a malfunctioning valve in the spacecraft’s fuel pressure system caused by salt deposits jamming the valve between the helium pressurization tank and the fuel tank. This resulted in high temperatures that damaged the engine’s combustion chamber throat and nozzle. JAXA adjusted the spacecraft’s orbit so that it would establish a heliocentric orbit, with the hopes that it would be able to swing by Venus again in the future. Initially, the plan was to make another orbit insertion attempt by the end 2016 when the spacecraft’s orbit would bring it back to Venus. But because the spacecraft’s speed has slowed more than expected, JAXA determined if they slowly decelerated Akatsuki even more, Venus would “catch up with it” even sooner. A quicker return to Venus would also be advantageous in terms of the lifespan of the spacecraft and its equipment. But this second chance will likely be the final chance, depending on how much damage there is to the engines and other systems. The reasons for making this final attempt are quite obvious. In addition to providing vital information on Venus’ meteorological phenomena and surface conditions, the successful orbital insertion of Akatsuki would also be the first time that Japan deployed a satellite around a planet other than Earth. If all goes well, Akatsuki will enter orbit around Venus at a distance of roughly 300,000 to 400,000 km from the surface, using the probe’s 12 smaller engines since the main engine remains non-functional. The original mission called for the probe to establish an elliptical orbit that would place it 300 to 80,000 km away from Venus’ surface. This wide variation in distance was intended to provide the chance to study the planet’s meteorological phenomena and its surface in detail, while still being able to observe atmospheric particles escaping into space. At a distance of 400,000 km, the image quality and opportunities to capture them are expected to be diminished. 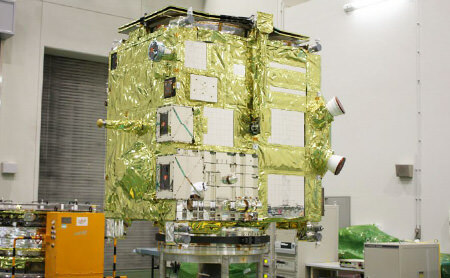 However, JAXA is still confident that it will be able to accomplish most of the mission’s scientific goals. In its original form, these goals included obtaining meteorological information on Venus using four cameras that capture images in the ultraviolet and infrared wavelengths. These would be responsible for globally mapping clouds and peering beneath the veil of the planet’s thick atmosphere. Lightning would be detected with a high-speed imager, and radio-science monitors would observe the vertical structure of the atmosphere. In so doing, JAXA hopes to confirm the existence of surface volcanoes and lighting, both of which were first detected by the ESA’s Venus Express spacecraft. 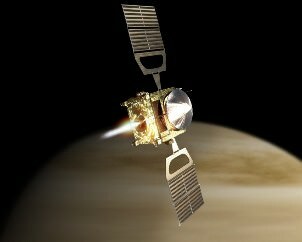 One of the original aims of Akatsuki was to complement the Venus Express mission. But Venus Express has now completed its mission, running out of gas and plunging into the planet’s atmosphere. But most of all, it is hoped that Akatsuki can provide observational data on the greatest mystery of Venus, which has to do with its surface storms. Previous observations of the planet have shown that winds that can reach up to 100 m/s (360 km/h or ~225 mph) circle the planet every four to five Earth days. This means that Venus experiences winds that are up to 60 times faster than the speed at which the planet turns, a phenomena known as “Super-rotation”. Here on Earth, the fastest winds are only capable of reaching between 10 and 20 percent of the planet’s rotation. As such, our current meteorological understanding does not account for these super-high speed winds, and it is hoped that more information on the atmosphere will provide some clues as to how this can happen. Between the extremely thick clouds, sulfuric rain storms, lightning, and high-speed winds, Venus’ atmosphere is certainly very interesting! Add to the fact that the volcanic, pockmarked surface cannot be surveyed without the help of sophisticated radar or IR imaging, and you begin to understand why JAXA is eager to get their probe into orbit while they still can. From faulty spacecraft to two damaged facilities, the past year has been a tough year for Japan’s astronomical programs. Yes despite the setbacks, Japan has already begun working to fix every problem they’ve faced in this difficult year. The troubles started late last year as Japan’s Venus exploring spacecraft, Akatsuki failed to properly enter orbit around Venus. Ultimately, the failure was blamed on a faulty valve that didn’t allow the thruster to fire for the full length of the burn necessary to transfer into the correct orbit. Instead, the craft is now in a wide orbit around the Sun. The organization in charge of the probe, the Japan Aerospace Exploration Agency (JAXA) announced earlier this month that they will “attempt to reignite the damaged thruster nozzle” and, if the test goes well, can try again for an orbital insertion in November 2015. The next setback came with the devastating March 11th earthquake which the facilities being used to study the samples returned from the sample and return mission Hayabusa were damaged. While the particles were safe, the sensitive accelerators that are used to study them suffered some damage. Restoration work is already underway and the teams in charge expect some operations to resume as early as this fall. Other instruments may take until early next year to resume operation. Despite the damage, the preliminary data (done before the Earthquake) has confirmed the particles are from the visited asteroid. They contain minerals such as olivine and iron sulfide contained in a rocky-type asteroid. No organic materials have been detected. More recently, Japan’s flagship observatory, Subaru atop Mauna Kea, Hawaii, was damaged when coolant leaked onto several instruments as well as the primary mirror, halting operations early last month. According to the National Astronomical Observatory of Japan (NAOJ) which maintains the telescope, the mirror was washed with water which was successful in restoring its functionality. The primary camera, the Subaru Prime Focus Camera (Suprime-Cam) and its auxiliary equipment were also affected and are currently being inspected. However, the telescope has a second focus, known as a Nasmyth focus. Several instruments which make use of this focus, including the High Dispersion Spectograph, the 188-element Adaptive Optics system, the Infrared Camera and Spectrograph, and the High Contrast Instrument for the Subaru Next Generation Adaptive Optics, were all unaffected. With the cleaning of the mirror and the use of these instruments, the telescope was able to resume operations on the night of July 22. With any luck, fortunes will continue to improve for Japan and their hard work and dedication can help them to overcome these issues. Ganbatte! The Japan Aerospace Exploration Agency (JAXA) is now considering making a second attempt to insert the Akatsuki probe into Venus’ orbit one year earlier than originally planned, in five years instead of six. After a malfunctioning valve in the spacecraft’s fuel pressure system caused the engine to function abnormally, Akatsuki failed to enter Venus’ orbit on Dec. 7, 2010 as planned. JAXA had said the spacecraft’s orbit around the Sun would put it in position for another orbit insertion attempt in about six years. But because the spacecraft’s speed has slowed more than expected, the agency now says it may be possible to slowly decelerate Akatsuki even more and let Venus “catch up with it,” according to a report in the Mainichi Daily News. Therefore, an attempt to enter orbit may be made sometime in 2015. A quicker return to Venus is also advantageous in terms of the lifespan of the probe and its equipment. After the original mission failure, JAXA had calculated that Akatsuki would make 11 trips around the Sun for every 10 Venus made, putting the next closest encounter between the spacecraft and planet sometime in December 2016 or January 2017. But subsequent examination of data showed Ataksuki’s engine power had dropped by almost 60 percent, slowing the spacecraft and making it possible to make a second attempt at entering orbit a year earlier. The bad news is that the slowdown is possibly caused by a malfunction in the fuel supply system or damage to the engine nozzle. If that is the case, the prospects for restoring full function are very low. Additionally, if the engine nozzle has been weakened, it will be difficult to decelerate the Akatsuki enough for orbital insertion when it again closes with Venus. But after consultations with engineers, JAXA is now considering trying to decelerate the craft a little bit at a time, allowing it to make eight orbits around the sun before Venus catches up with it in five years. The Japanese space agency has deduced that a faulty engine valve was the reason the Akatsuki spacecraft did not go into orbit around Venus as planned on December 6, 2010. According to the Daily Yomiuri, a malfunctioning valve in the probe’s fuel pressure system caused the engine to function abnormally. The valve is a standard component in many previous space missions, JAXA said, and it was not modified at all for Akatsuki. Earlier, JAXA reported that Akatsuki’s engine did perform a burn to slow it down, but 152 seconds into the burn the fuel pressure dropped and the probe became unbalanced. Because the retrofiring of the rockets failed to slow down the probe enough for Venus to capture it, it was unable to enter into orbit around the planet, and then went into safe mode. After Akatsuki’s launch in May, the functions of its main engine were tested in June. However, the engine was fired for too short a time to detect the problem with the valve, JAXA said. The findings were presented to the Education, Culture, Sports, Science and Technology Ministry’s Space Activities Commission. While JAXA is still trying to get an exact handle on the problems that the Akatsuki probe sent to Venus encountered, there is a little bit of news leaking out. JAXA held a press conference last night, and the Yomiuri Shimbun newspaper has a brief recap of the conference. During some of the systems checks on the probe, it also took a few images of Venus, and many of the instruments on the probe appear to be working okay – it’s the engine that’s having the most problems. Here’s what is known so far: Akatsuki’s engine did perform a burn to slow it down, but 152 seconds into the burn the fuel pressure dropped and the probe became unbalanced. Because the retrofiring of the rockets failed to slow down the probe enough for Venus to capture it, it was unable to enter into orbit around the planet, and then went into safe mode. As to what caused the sudden drop in fuel, JAXA currently suspects that there is a damaged pipe or valve that reduced the flow of helium into the engine, but that is still speculative. As the engine burns propellant (Akatsuki uses a hydrazine/nitrogen tetroxide engine), helium flows into the tank to maintain the pressure. Something failed in the helium injection flow, and precipitated a drop in internal tank pressure, reducing the flow of propellant and causing the engines to stop burning. The ceramic nozzle of the engine is also thought to have been damaged by the misfiring, which may make the task of trying to get the probe to Venus when the chance comes around again in six years a daunting one. JAXA is planning on doing some tests on the ground to maybe come to a workaround of this problem. There seems to be plenty of fuel left, which is good news, but the damaged nozzle is not. Maybe they’ll call in some Hayabusa team members, and pull it through. The Christian Science Monitor reported yesterday that there is some speculation that something may have struck the probe, though this most recent press conference from JAXA makes no mention of it. Also, Emily Lakdawalla at The Planetary Society Blog reprinted some tweets translated from Japanese that summarize details from the press conference, as well as the Yomiuri Shimbun article. JAXA announced that the Akatsuki spacecraft failed to enter orbit around Venus. The orbit insertion maneuver was performed, the space agency said in a statement, but “unfortunately, we have found that the orbiter was not injected into the planned orbit as a result of orbit estimation.” While extremely disappointing, perhaps not all is lost. If the spacecraft can be stabilized, there is a chance it could enter orbit in 6 years when it passes by Venus again. 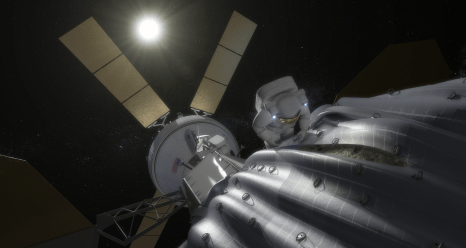 At a press conference, project manager Masato Nakamura said (from translated reports) that the spacecraft is functioning but has put itself in a standby mode with its solar panels facing towards the Sun. It is also spinning slowly — about every 10 minutes — and radio contact is possible only for 40 seconds at a time. Engineers are using ground antennas in Japan as well as NASA’s Deep Space Network to send commands to stabilize the spacecraft and to determine its trajectory. JAXA said they have set up an investigation team to study the cause of the failure, and will provide updates with the countermeasures and investigation results. Japan had a similar situation occur with their Nozomi spacecraft at Mars in 2003, when they lost contact with the spacecraft just 5 days before orbit insertion around the Red Planet. Akatsuki was launched from the Tanegashima Space Center on May 21, 2010.